When I work with peers, colleagues and my students, I often hear about how depleted they feel because of work. A common dilemma known as burnout, this is a mental or physical collapse that’s typically caused by being overworked. They’re stressed, they’re tired, and they feel no motivation to move out of the rut that they’ve fallen into. If this sounds like you, it may be time for a burnout treatment. Burnout is real, and it creeps up on us. It won’t go away on its own. Rather, it will get worse unless you address the underlying issues causing it. Most issues deal with being overworked, but it could also stem from low self-esteem or undervaluing yourself. If this sounds like you, what do you think is causing you to feel that way? Discovering the core issue will help you fine tune the treatment to fit your needs. Everyone is unique here and that’s okay. Figure out why you’re feeling burnt out. First, look at any resentment that you feel. Often, feelings of resentment point to something important that is missing. Why is burnout treatment so important? If you ignore burnout, it will only cause you further harm down the line, so it's important that you begin recovery as soon as possible. Burnout is something that’s better off being dealt with before it shows up because it’s hard to eliminate once you have it. This is where burnout treatment comes into play. Make sure that you’re getting at least 8 hours of sleep every night. I know that this is easier said than done for most of us. We get easily distracted by technology or wanting to get last minute things done before bed. Here is what you should do: set a specific time you want to get up each morning and then pick a bedtime that will allow you get 8 hours of restful sleep. You should wind down 30 minutes before that bedtime with a bath, low lighting, relaxing aromas, and a good book. Keep your smartphone as far away as possible, especially if that’s the reason why you’re staying up late at night. I recommend that you create a habit out of this. While exercising may feel like another thing to add to your to-do list now, once you get started, you’ll never want to stop! Not only is exercise good for you, but it’s also been known to improve your sleep. That’ll make the previous step easier to achieve. Sometimes we need a change of scenery to experience a different perspective. When we feel stuck creatively, it’s because we aren’t stimulating our senses with new experiences. Stepping away from our work can allow us to refuel and come back with new motivation. Hear me out on this one. I’m not telling you to give up on your goals. What you should do is look at how realistic your deadlines are. If you’re trying to succeed with completing a HUGE task with a timeline that’s too strict, you’re going to stress yourself out. Plus, your work will suffer for it. Be real and honest with yourself regarding what you can and can’t handle. We’re all human, and it’s okay to admit that we can only handle so much. Use essential oils to relax the senses and create a positive brain flow. Take a bath once in a while. Treat yourself with something nice like a manicure, a dance lesson, or a painting class! Whatever sounds fun to you, I think you should do it. Affirmations and meditation are two beautiful things. They can help us shift our mindset and give us clarity. We all need emotional support, and we should prioritize that. An affirmation like, “I’m not perfect but I am worthy, and my skills are valuable.” Meditation doesn’t have to be complicated. You can do something as simple as laying still in bed and focusing on your mind, body and soul. The key thing is to remain still. What do you think about my ideas for burnout treatment? If you like these ideas, the best way to change your situation is to get started today on changing it. Don’t put it off because then the burnout will never truly go away. Once you discover the root causes of your burnout, look at what you can do to resolve it. This might involve delegating some of your responsibilities to others, adding more autonomy to your job, working from home one day a week, or even changing roles. Say no to things more often. 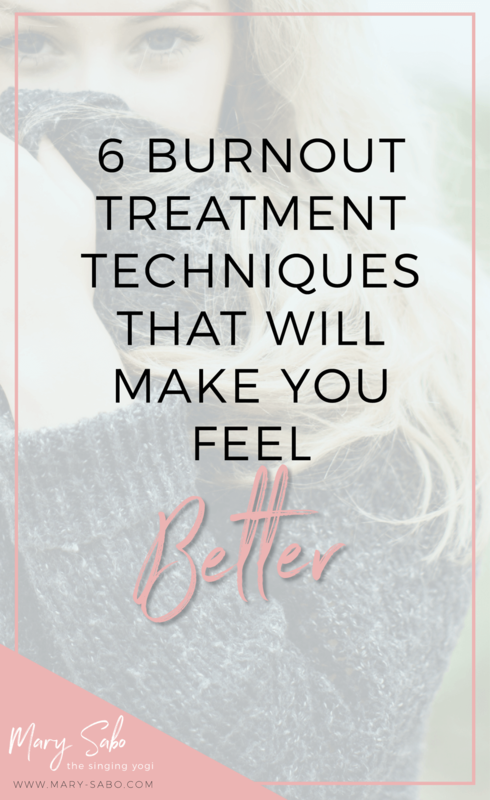 Burnout treatment is just as real as having burnout. You have to take care of yourself and treat it just like you would a cold. You wouldn’t let a sore throat linger on, would you? Of course not! You would be drinking hot tea with lemon around the clock. Treat your burnout the same way, and watch your results drastically change.